Okay, so I have a Mercury-class colonial battlestar model that is a 3 inch die cast titanium model (which I will assume for the sake of canon will also include my 200 Viper mark 2's and 50 Raptors, cuz that is how much the Battlestar Pegasus had). Problem is what to call my battlestar. I want to call her Enterprise, but I don't want to violate copyright laws.... -_- Any ideas? Call it whatever you like, Enterprise included. The name isn't copyrighted. 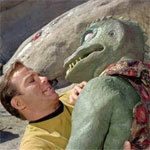 GrahamKennedy wrote: Call it whatever you like, Enterprise included. The name isn't copyrighted. But that's just the thing. This goes back on my discussion point about Galactica being their version of the Enterprise. The only thing that the Galactica would need to do is be called Enterprise, cuz short of that, it actually is borderline quite rather redundant. You can call it whatever you want. Copyrights don't apply to you unless you plan on opening a business on BSG diecast models named Enterprise. No one would bother with a law suit for someone naming a model. Galactica was the Bucket, Pegasus was the Beast. If this ship is a model of the Pegasus class, and Galactica was their equivalent of the Enterprise class, then naming it Enterprise is wrong. Coalition wrote: Galactica was the Bucket, Pegasus was the Beast. If this ship is a model of the Pegasus class, and Galactica was their equivalent of the Enterprise class, then naming it Enterprise is wrong.